Within the next four weeks the Apple iPhone will become a practical reality - you'll be able to hold one, buy one, covet one, even lick one. Given Apple's infamous secrecy it's no surprise that rumours about this the IPhone are legion. Now we've sorted the wheat from the chaff to help you get your head around this already iconic mobile phone. Apple may have settled its dispute with Cisco systems over the name iPhone (though if the details, which haven't been made public, are similar to the 'limited use' agreement it had with the Beatles' Apple Corps , then there could be more fun in store) but they may also face some other legal challenges. There have been suggestions that the automatically rotating screen may in fact infringe a copyright owned by Sony Ericsson , though Canon has also been using a similar technology in its cameras for some time. So far Sony Ericsson has made no public representation to Apple on the subject. Potentially more serious is the ongoing case brought by Quantum Technology Management, a British outfit that says it owns a patent on 'capacitive field sensing', which the iPhone's screen may have infringed. The iPhone's screen is very likely to be the most sophisticated ever seen on a commercial device. Yes it's big and beautiful (88.9mm, 320x480 pixels) and touch sensitive. But it's also exceptionally sensitive and much smarter than anything you'll have tried before - and rumoured to be one of the most expensive to manufacture at $60 (£30) a pop. Most touch-sensitive phone screens have trouble dealing with more than one touch at a time, but the iPhone's should be capable of processing up to 15 - more than enough unless you plan on getting more than intimate with your iPhone and a few friends. It's enough for a full-size virtual keyboard - that's for words, though a piano keyboard could be possible as an additional app. You'll also be able to zoom in and out by touching two fingers on the screen and moving them together or apart and it will be able to orientate itself to portrait or landscape mode by sensing which way round you're holding it. We haven't even got the iPhone yet, but Apple has filed a patent for a smaller, future generation model that could be named the iPhone nano. One side features a touch pad while the other features a display - the idea is that you'll be able to see on the front what you're touching on the back. Clever, no? 4. Who'll get the iPhone first? T-Mobile is so far out in front as the favourite European network to carry the iPhone. Vodafone was previously considered the favourite but the company has now publicly denied it. Orange and O2 , once both in the running are said to have failed in the later bidding stages. 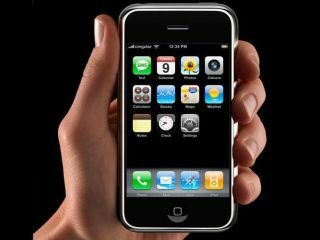 In the US the iPhone will launch with AT&T (formerly Cingular). Concern continues about the iPhone's potential battery life. Apple had a weak reputation on battery life for the iPod . While that has largely been addressed, there are plenty of MP3 players that will keep partying long after the equivalent iPod has sipped its cocoa and climbed the wooden hill to Bedfordshire. The main concern is that at just 11.6mm the iPhone is simply too thin to house a decent battery from Apple, especially one that has to power that fancy screen. Apple is claiming five hours talk time and 16 hours playback, which isn't bad - but when did you last hear of a manufacturer's battery life estimates being accurate? Pretty much as soon as the iPhone was announced, manufacturers have been working overtime to develop potentially lucrative accessories for it. But some of these accessories could end up as essential purchases if early reports about the iPhone's slippery surface prove to be true - there are dozens of anti-slip protective casings being created for the iPhone. And given the infamously scratch-centric nature of the iPod, a scratch-proof coating for that glorious screen is more likely to be a necessity than an option. Delay? No way! The iPhone will positively, definitely, absolutely make it to market on time. A story on Endgadget, allegedly quoting an internal Apple email, which suggested that Apple's precise release date of 'June' might be slipping was quickly withdrawn after assurances from Apple that all was well. That's in the US only by the way, the European release is still expected in the last quarter of 2007. For all its good looks and shedload of new patents, one of the main aspects of the iPhone is looking distinctly underpowered - its internet access. Apple has said that it will use EDGE , the 2.75G system popular in the US but which never really took off over here. But with many phones now using HSDPA 3G access, with download speeds of up to 1.4Mbps, that isn't going to wow anybody on this side of the pond. It's possible that by the time the iPhone reaches Europe later this year it may have acquired a 3G chip of some sort. But it's also entirely possible that we might have to wait for iPhone 2.0 for that to happen. In the meantime, you'll need to rely on the iPhone's Wi-Fi connection for fast internet access.